U.S. Air Force photo/Jet FabaraA KC-46 Pegasus takes its first flight at Paine Field in Everett, Washington, September 25, 2015. 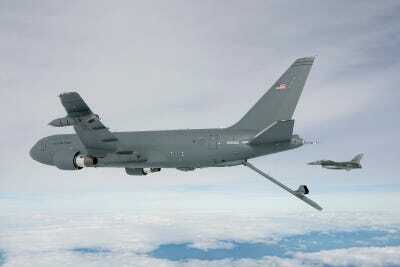 Additional high-profile problems have cropped up with the Air Force’s new tanker, the KC-46 Pegasus. 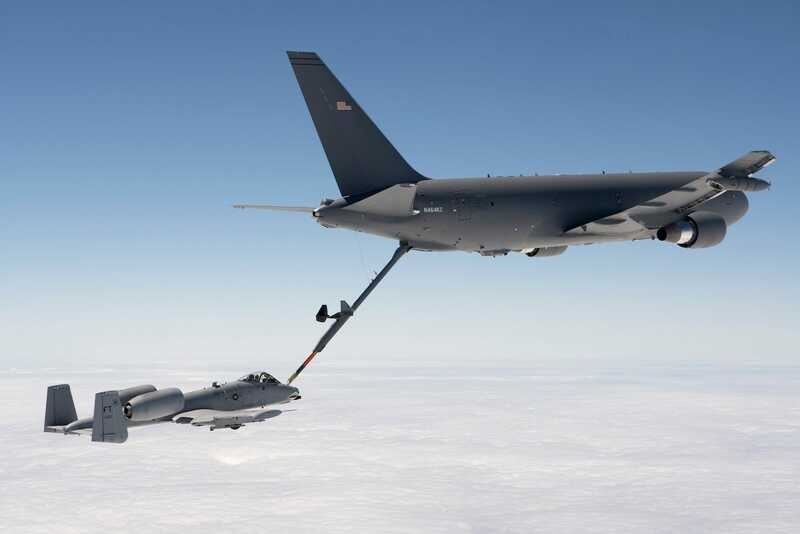 Boeing’s KC-46 tanker program, long waylaid by technical issues, is now facing more “category one” deficiencies, adding to the problems the contractor has to fix and further endangering the tanker’s delivery deadline. The remote vision system is not meeting Air Force requirements,according to Defence News. Problems with the RVS hinder “the boom operator’s ability to guide the refuelling boom and drogue into receptacles on the receiver aircraft,” Aviation Week Pentagon editor Lara Seligman said on Twitter on Thursday. Issues with the RVS have also contributed to the likelihood of the tanker’s boom scraping against the exterior surface of the receiving aircraft – a previously disclosed category-one problem that can damage stealth aircraft. Boeing is working on a software update that it hoped would correct the RVS issue, Seligman added. The other issue involves the centerline drogue system, the tanker’s other refuelling system, which in tests was unexpectedly disconnecting from the aircraft receiving fuel. The Air Force and Boeing “are performing the necessary systems engineering analysis to determine the root cause and path forward,” Seligman said. The problem does not present any “immediate” safety risk, according to Defence News. The Air Force does not have a set timeline for when these new problems will be fixed, Air Force spokeswoman Ann Stefanek told Defence News. Boeing/John D. ParkerA KC-46 Pegasus refuels an A-10 Thunderbolt II with 1,500 pounds of fuel, July 15, 2016. The mission was the last of all flight tests required for the tanker’s Milestone C production decision. 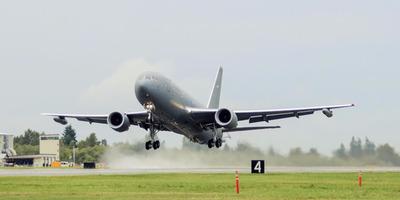 In addition to the previously reported issue with the boom scraping the receiving aircraft, the KC-46 program has also been dogged by problems with its high-frequency radio, which uses the skin of the tanker to broadcast and can cause sparks and fires, and with the boom itself extending on its own when disconnecting from a refuelling aircraft. Boeing is obligated to hand over 18 of the new tankers to the Air Force by October, but the service now expects the planes will arrive in spring 2019. However, Stefanek told Defence News, the recent deficiencies have not led the Air Force to change its schedule projection. Boeing/John D. ParkerThe KC-46A Pegasus deploys the centerline boom for the first time, October 9, 2015. Because of the way the KC-46 contract is structured, the Air Force is not responsible for costs beyond its $US4.82 billion commitment. Boeing has already been hit with nearly $US3 billion in pretax costs. The Air Force currently plans to buy 179 of the KC-46. Once they start to arrive, the service will begin phasing out its older KC-10 tankers. It will hold on to 300 of its KC-135 – which average 55 years old. Asked about the status of tanker program during a House hearing on Wednesday, Air Force acquisition chief Will Roper said the speed with which Boeing fixes problems will be “key metric” in the service’s evaluation of the program in the future. “The fact that there are issues on the program is less concerning to me. What will concern me during this year is if issues don’t get retired quickly,” Roper told lawmakers, according to Defence News.